Alexios V Doukas, in Latinised spelling Alexius V Ducas, was Byzantine emperor from 5 February to 12 April 1204, during the second and final siege of Constantinople by the participants of the Fourth Crusade. His family name was Doukas, but he was also known by the nickname Mourtzouphlos or Murtzuphlus (Μούρτζουφλος), referring to either bushy, overhanging eyebrows or a sullen, gloomy character. He achieved power through a palace coup, killing his predecessors in the process. Though he made vigorous attempts to defend Constantinople from the crusader army, his military efforts proved ineffective. His actions won the support of the mass of the populace, but he alienated the elite of the city. Following the fall, sack, and occupation of the city, Alexios V was blinded by another ex-emperor and later executed by the new Latin regime. 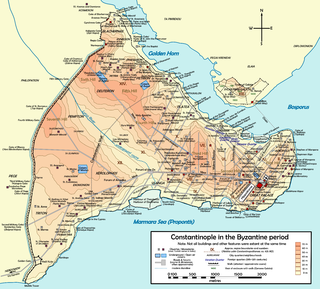 He was the last Byzantine emperor to rule in Constantinople until the Byzantine recapture of Constantinople in 1261. Enrico Dandolo was the 41st Doge of Venice from 1192 until his death. He is remembered for his avowed piety, longevity, and shrewdness, and is known for his role in the Fourth Crusade and the Sack of Constantinople. Alexios IV Angelos or Alexius IV Angelus was Byzantine Emperor from August 1203 to January 1204. He was the son of Emperor Isaac II Angelus and his first wife, an unknown Palaiologina, who became a nun with the name Irene. His paternal uncle was Emperor Alexius III Angelus. 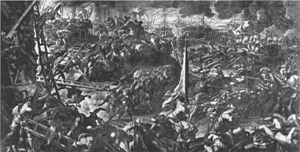 The Siege of Zara or Siege of Zadar was the first major action of the Fourth Crusade and the first attack against a Catholic city by Catholic crusaders. 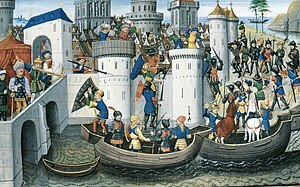 The crusaders had an agreement with Venice for transport across the sea, but the price far exceeded what they were able to pay. Venice set the condition that the crusaders help them capture Zadar, a constant battleground between Venice on one side and Croatia and Hungary on the other, whose king, Emeric, pledged himself to join the Crusade. Although some of the crusaders refused to take part in the siege, the attack on Zadar began in November 1202 despite letters from Pope Innocent III forbidding such an action and threatening excommunication. Zadar fell on 24 November and the Venetians and the crusaders sacked the city. 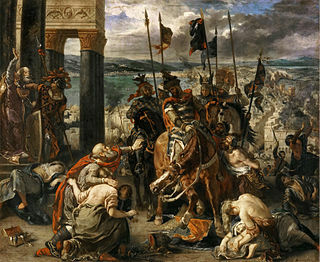 After spending the winter in Zadar the Fourth Crusade continued its campaign, which led to the Siege of Constantinople. Thomas F. Madden is an American historian, a former Chair of the History Department at Saint Louis University in St. Louis, Missouri, and Director of Saint Louis University's Center for Medieval and Renaissance Studies. A specialist on the Crusades, he has often commented in the popular media after the events of September 11, to discuss topics such as how Muslims have viewed the medieval Crusades and their parallels to today's interventions in the Middle East. He has frequently appeared in the media, as a consultant for various programs on the History Channel and National Public Radio. In 2007, he was awarded the Haskins Medal from the Medieval Academy of America, for his book Enrico Dandolo and the Rise of Venice, also a "Book of the Month" selection by the BBC History magazine. In 2012, he was named a Fellow of the John Simon Guggenheim Memorial Foundation. The Nicaean–Venetian Treaty of 1219 was a trade and non-aggression defense pact signed between the Empire of Nicaea and the Republic of Venice, in the form of an imperial chrysobull issued by Emperor Theodore I Laskaris. This treaty, which provided the Venetians freedom of trade and imports without customs duties throughout the Empire in exchange for not supporting for the newly created Latin Empire.